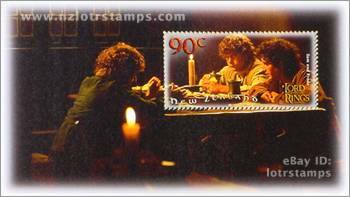 These Fellowship Miniature Sheets Stamps commemorate key moments and principal characters from Peter Jackson’s award-winning ‘The Lord of The Rings: The Fellowship of The Ring’ motion picture which was based on J.R.R. Tolkien’s timeless Middle-Earth trilogy. 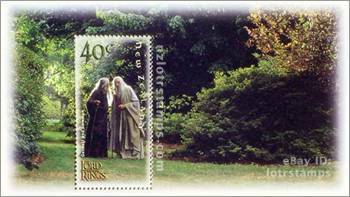 Much in demand by collectors, these Fellowship of the Ring stamps pay tribute to ‘The Lord of The Rings’ and explore Tolkien’s classic saga in a manner that movie enthusiasts, stamp lovers, and fans will enjoy and appreciate. 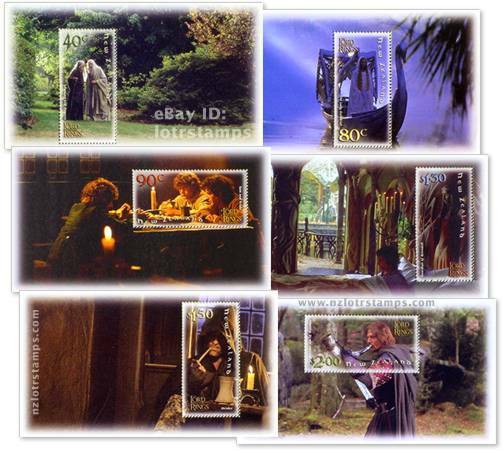 SIX UNIQUELY INSPIRED Fellowship of the Ring Miniature Sheet stamps illuminating pivotal players and scenes from the award winning ‘The Lord of The Rings: The Fellowship of The Ring’ motion picture. 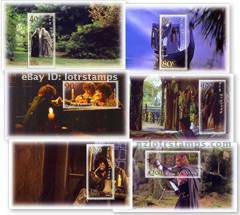 These Miniature Sheet measure 2 1/2 H x 4 1/2 W inches; 65 x 115 mm and the set of six comes in a clear, archival quality protective sleeve, and includes a full-colour ‘Fellowship of The Ring’ official brochure containing background information on the Dec. 4, 2001 stamp release and the epic year-long production it honours. A second OOP ‘The Two Towers’ set was issued in December 2002 and a third ‘The Return of the King’ set was released in November 2003 to commemorate ‘The Lord of the Rings’ movie trilogy. See below for additional information about Miniature Sheets. WE WILL ALSO be offering occasional ‘The Lord of The Rings: The Fellowship of The Ring’ Maximum Postcards, Stamp Booklet and Presentation Packs - either purchase direct or check our regular auctions. 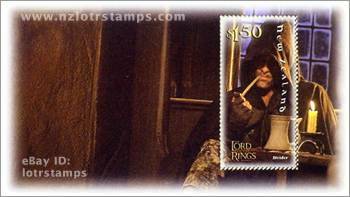 As these limited edition Fellowship of the Ring stamps were only on sale in New Zealand and sold out much faster than anticipated, supply is strictly limited to that in stock, i.e. delay too long and you may be disappointed. Walking in the garden of Isengard, the wizard Gandalf the Grey (Sir Ian McKellen) tells Saruman the White (Christopher Lee), that the long lost Ruling Ring of the Dark Lord has been found, unaware that Saruman also means to obtain it. Abroad, the dark forces of Sauron in the sinister black-cloaked shape of the Ringwraiths, search for it. The Lady of the Golden Wood, Galadriel (Cate Blanchett), founded and became Queen of Galadrim during the War of the Ring. Although offered the One Ring by Frodo, the Elf Queen refused revealing to him that it’s power could corrupt even her. Young Hobbits Frodo Baggins (Elijah Woods) - The Ringbearer, accompanied by his good friends Samwise ‘Sam’ Gamgee (Sean Astin) and Pippin ‘Peregrin’ Took (Billy Boyd) enjoy an ale in the Inn of the Prancing Pony, while nervously awaiting the arrival of Gandalf. Frodo attracts unwanted attention with his sudden 'disappearance' in front of the assembled villagers. After being near mortally wounded by a Morgul knife while escaping the pursuing Ringwraiths, Frodo awakens at Rivendell, unaware of having been on the brink of death. Now safe under the protection of the Elves, Gandalf informs him that the Council of Elrond and several old friends including his uncle Bilbo (Ian Holm) await. The mysterious stranger Strider (Viggo Mortensen) watches Frodo and company from the shadows in the Inn of the Prancing Pony, Bree. One of the secretive band of Rangers who roam the wild lands, he is later revealed to be Aragorn, son of Arathorn, Chieftain of Arnor, and rightful Heir of Gondor. Boromir (Sean Bean) of Gondor, son of Denethor II, blows the ancient Horn of his people to warn of a savage Uruk-Hai raiding party led by the huge Orc, Lurtz. 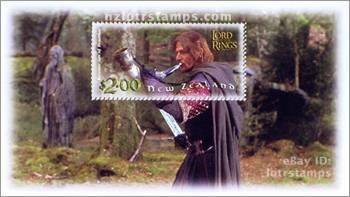 Boromir’s disregard for The Ring’s corrupting power was to be his downfall. He valiantly gave his life defending Pippin and Merry, shortly after Frodo left The Fellowship at Amon Hen to strike out for Mordor on his own. Miniature Sheets: These are stamps displayed in an attached illustrated panel. 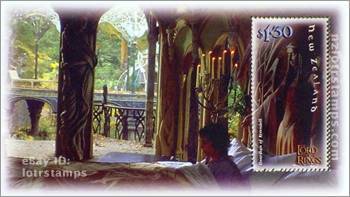 The Fellowship of the Ring Miniature Sheets portray the origin of each stamp image, which are derived from key scenes and moments in ‘The Lord of The Rings: The Fellowship of The Ring’ motion picture. 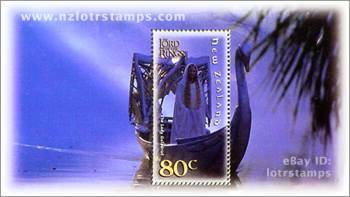 This issue was only released in New Zealand on 4 December 2001 and sold out quickly. Additional Info: Miniature Sheets are unhinged mint (UHM). A second ‘The Two Towers’ set was issued in December 2002 and a third ‘The Return of the King’ set was released in November 2003 to commemorate the Middle-earth movie trilogy.